GoEast is happy to be presenting a photography exhibition on the peaceful revolution in the Ukraine in the Bellevue Room during the week of the festival. After having been exhibited at the European Parliament and the Ukranian Embassy in Berlin, these suggestive photos will now serve to remind goEast’s public of those exciting and moving days, which most people probably followed on the news. They were days that changed the country. 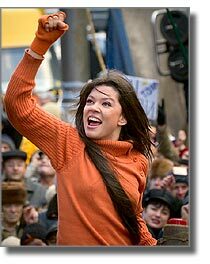 The “Revolution in Orange” not only led to a shift of power in the Ukraine; it also brought forth a new people. 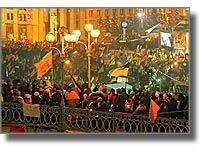 If in the past Ukrainians had seemed handicapped by the power structures in their country, they now poured into Majdan- independence square- by the thousands. They were saying “no” to election fraud, shadow economy, the black market, corruption and organized crime. Thousands took to the streets, which lay deep in the snow, camping on the Kreschtschatik mile despite the biting cold, blocking government buildings and the president’s palace- in the name of justice, democracy and closer ties with the EU. This exhibition shows the work of five photographers who were present at the “Revolution in Orange”: Sergej Grebenjuk is a free-lance photographer. Edward Galagan is a photo artist in a design studio. Pvlo Terechow, Josef Ziwenki and Natalija Krawtschuk work as photographers for the magazine “Korrespondent”. On Sunday, April 10th at 9 p.m. goEast warmly invites you to a refreshment at the exhibition. Eastblock will also take this opportunity to present its CD, “Ukraine- Songs of the Orange Revolution”. Exhibition: 06.04. to 12.04., 10 a.m. to 6 p.m.